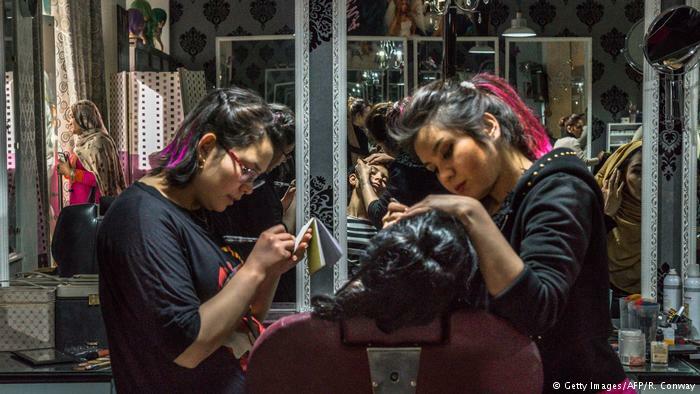 The photos in the window promise much: languorous, kohl-rimmed eyes and bright, bold nails — but once you enter the beauty parlours of Kabul, it becomes clear the images outside are a pale reflection of the vibrant reality inside. 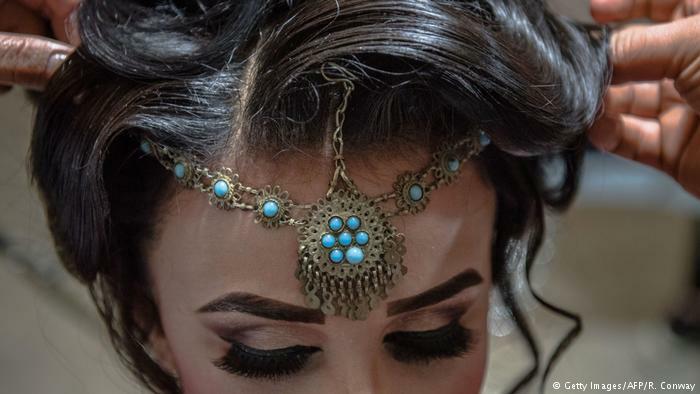 After the Taliban regime was toppled in 2001, small oases of glamour began to flourish in the Afghan capital — glittering feminine spaces in stark contrast to the dusty, dangerous, male-dominated streets outside. 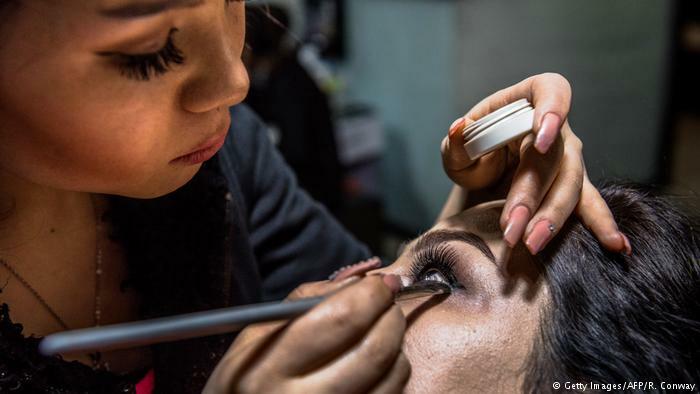 In Kabul’s city centre they line entire streets, their interiors protected from the male gaze by windows papered over with images of outrageous make-up and sophisticated hairstyles, their entrances barred by a screen or a simple curtain. Once the thresholds to these sheltered boudoirs are crossed, veils and scarves are shed: girls emerge from the burqas to reveal leggings and necklines, scooped backs and even — in the summer — tank tops. Scraps of conversation between women of all generations mingle with the sound of hairdryers and the smell of varnishes and lotions. 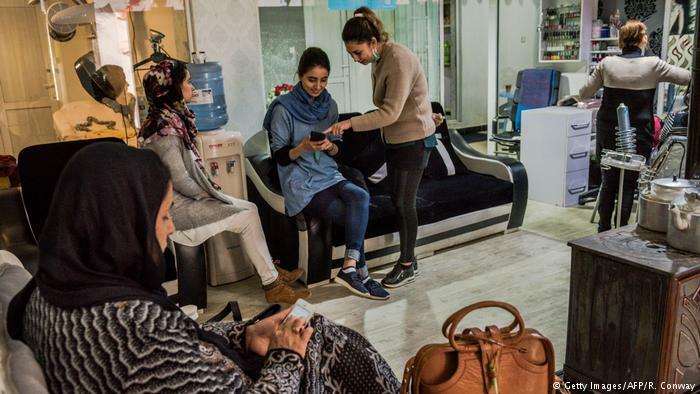 “The families who bring their girls here, they are happy that it’s just for girls, so… they know it’s very safe,” says Athena Hashemi, owner of the upmarket salon “Henna”. The 32-year-old beauty, her long hair loose and her face barely made up, opened her salon two years ago after training in Dubai. She now employs 17 aestheticians. “They are the best in town,” customer Muzhda asserts, a hairdresser intent on the complex architecture of her curly chignon. 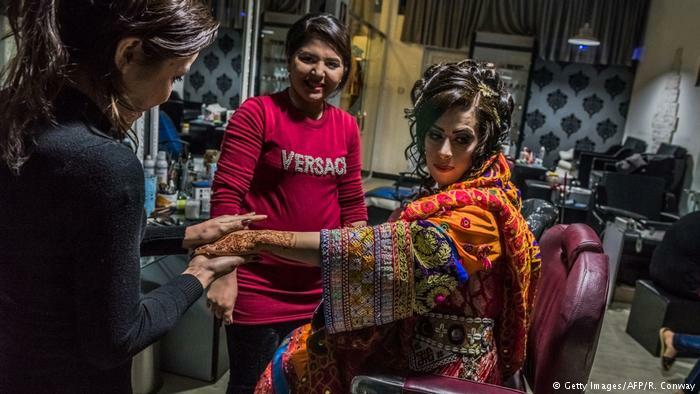 Frequented by the wealthy and local celebrities, Henna is also the most expensive: the “special bride pack” is 9,000 afghanis ($136) and includes full body waxing (6,000 afghanis). Most have already donned their richly embroidered evening gowns — but wait until the last moment before donning their high heels. 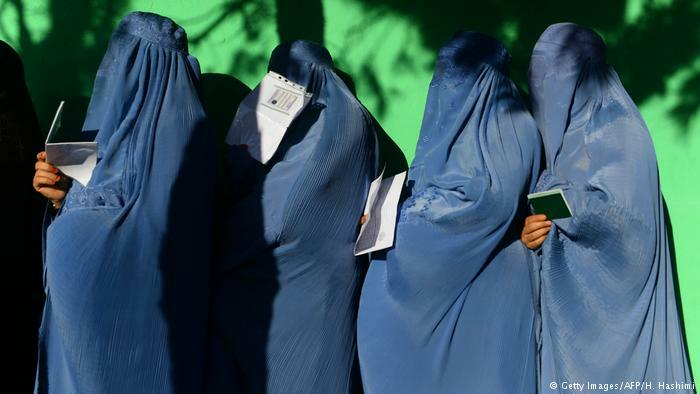 “Afghan women are now very fashionable,” explains one customer. 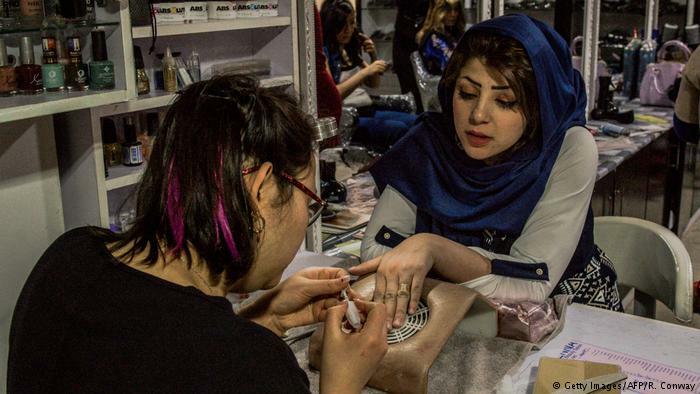 Make-up that challenges traditional Afghan notions of decency is favoured: foundation caked on, eyes framed in false eyelashes and iridescent, bold powders. “They tell me, ‘Add more! Add more! '” sighs Athena. A woman enters with her face blanked by white powder, like a sort of Afghan Pierrot, seeking help from the masters at Henna with her make-up disaster. “Look what they are doing in other salons!” Athena laments. Muzhda’s sister will marry tonight, and the women of her family are gilding themselves in make-up, manicures, blow-outs and henna. Hama, a doctor in a large maternity hospital in the city, arrives with her daughter who is paying her first trip to the salon ahead of a cousin’s wedding. After the ministrations, now adorned in false eyelashes, golden eye shadow, and with lips the colour of petunias, little Mariam — aged 16 — looks 30. Weddings are a rare oppportunity to go out, says her mother, the pins in her hair scaffolding for her heavy locks. With kidnappings and militant attacks on the rise in Kabul Hama and her family, like many others, no longer frequent restaurants, avoid large gatherings, and do not travel outside the city on roads infested with Taliban. So for weddings, she says, the sky is the limit. Some years ago a young researcher, Rima Kohli, looked at the effects of make-up on Afghan women after nearly four decades of war, including years of suffering under the Taliban’s mysogynistic rule. 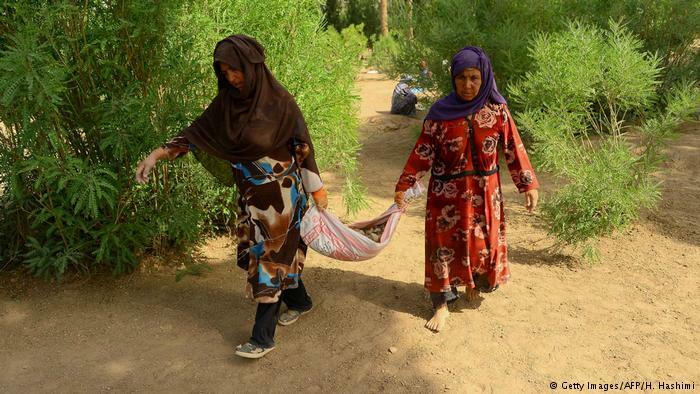 “Women suffered the worst psychological, emotional and mental effects of this war,” she said. Yet, for the most conservative, beauty salons remain abominations. Athena has no illusions. “Even today, years later … they can threaten us. We must remain prudent,” she says.